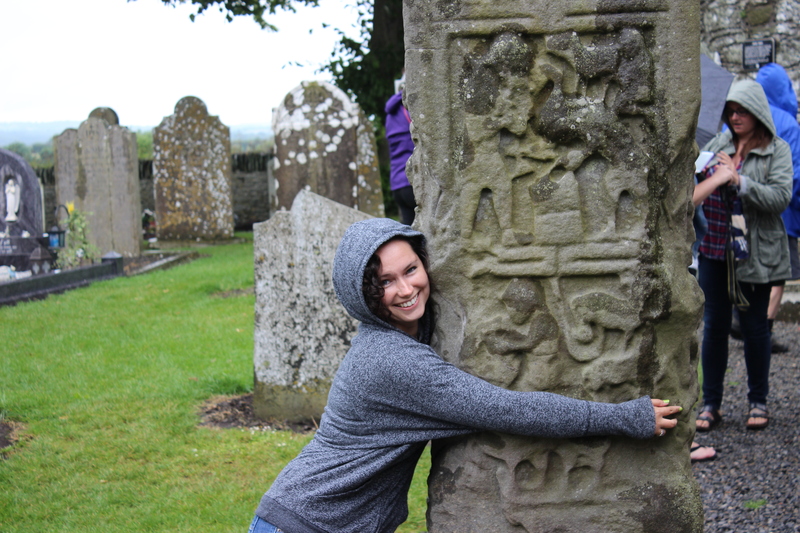 Those of you who know us or may be following along with my blog will probably know that the Husband and I were looking forward to a vacation in Ireland. Since we never had a proper honeymoon, we considered our 8 days there to be our belated one. Two years late is better than never, right? Well now we’re back and holy wow, do I have some blogging to do. Most of our time in the Emerald Isle was spent enjoying a bus tour with Paddywagon. Paddywagon tours have become wildly popular, and they range from single day tours to 9-day tours covering all of Ireland. 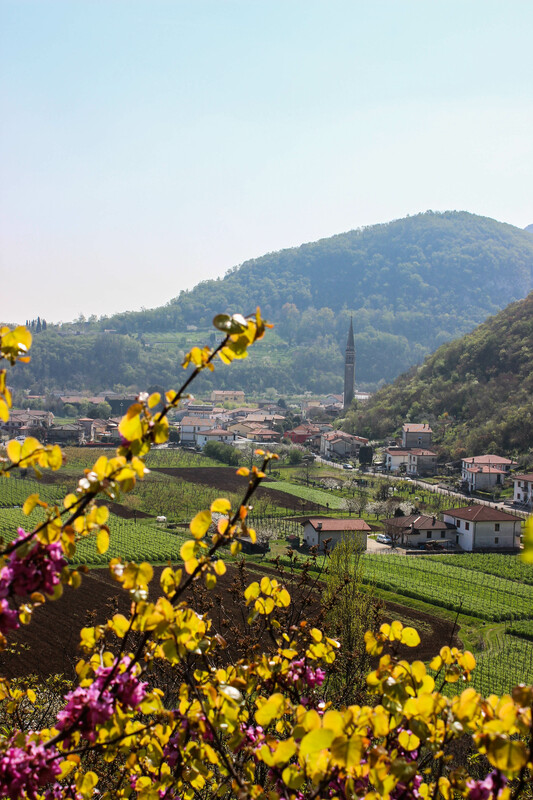 They offer both a cheaper “backpacker” package (where you’ll stay nights in hostels) as well as an “economy” package (where you’ll stay in B&Bs with private rooms). They used to offer a higher-end package with hotel overnights, but this has been taken off the menu. I think it’s for the best, because B&Bs are the way to go. 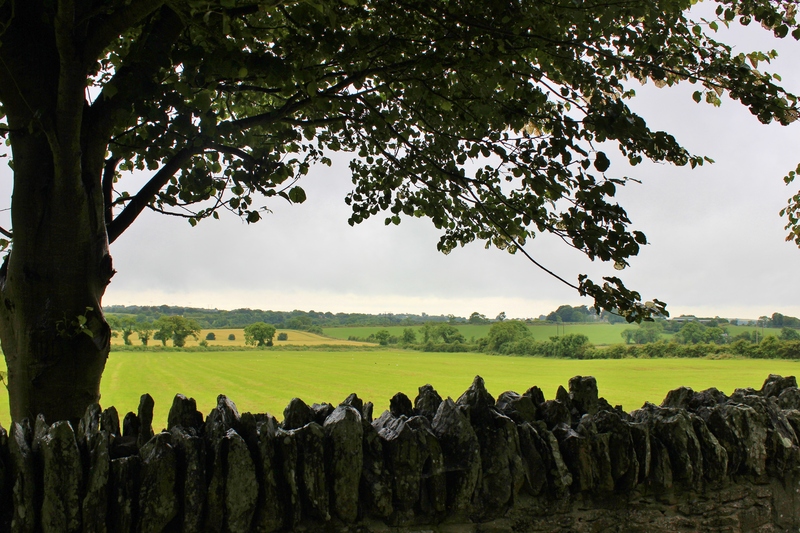 Alex and I chose their 6-day “All Ireland” tour, the first two days of which were spent in Northern Ireland. As a result, these first couple of blog entries will be a bit heavy on the history and conflict of the area. 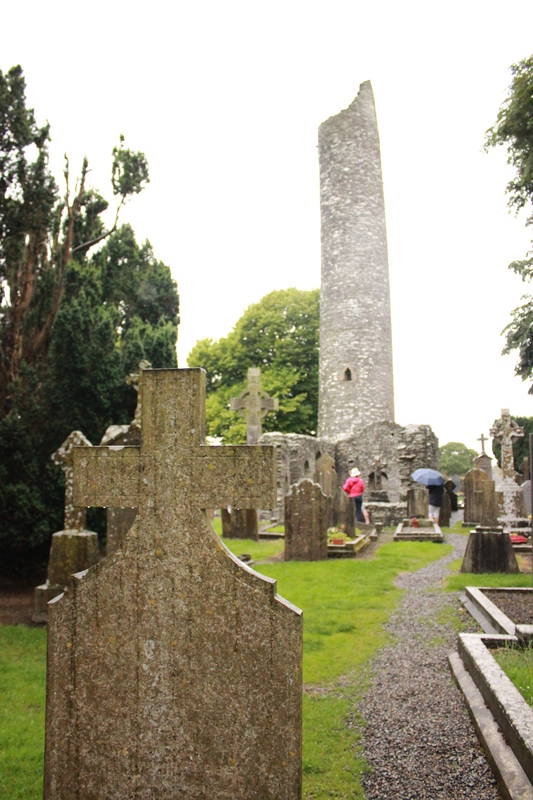 After all packing into the bus, we headed from Dublin to Monasterboice, a 5th century Christian settlement. At one time it may have been a monastery, but today it’s mostly a cemetery. The oldest and most important parts of the area are the high crosses from the 10th century and the ancient round tower. 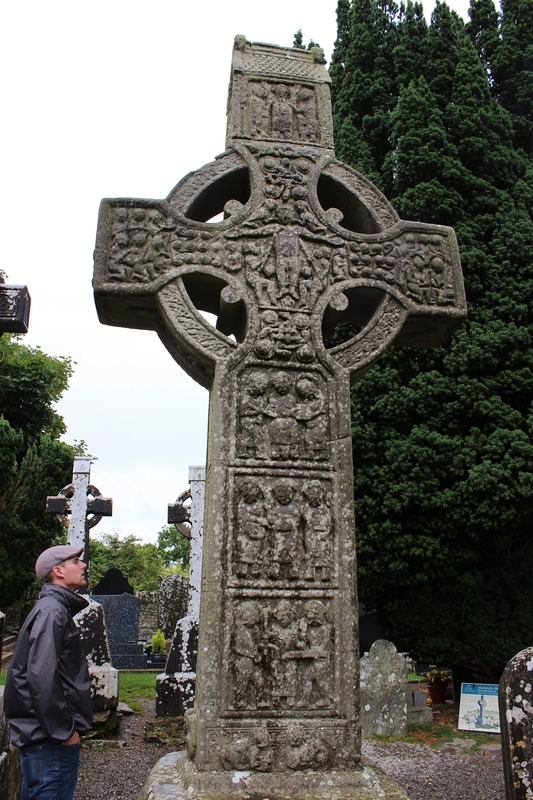 One of the high crosses here is named Muiredach’s Cross after a 10th century abbot, and is considered the finest high cross in Ireland. It was made in the 9th or 10th century and stands at 5.5 meters tall. As you can see from the photo, it’s in excellent condition and the biblical carvings are still easy to make out. 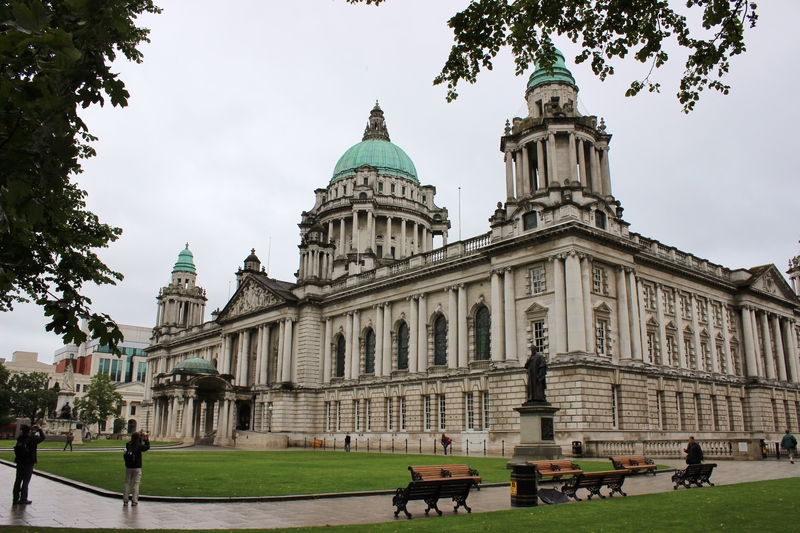 After that it was on to Belfast in Northern Ireland, where we started by seeing a little bit of the downtown area including the city hall building. 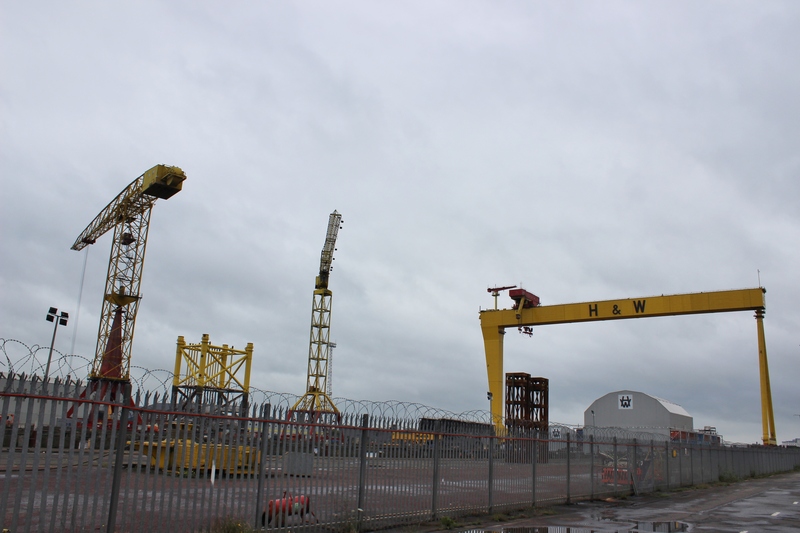 Next we went to the Titanic District of the city to see the cranes (named Samson and Goliath) and building site where the Titanic was built. There is a museum dedicated to the ship, but we weren’t too worried about that. Instead we walked around outside and saw the shipyard and exhibits there. The posts behind us show the outline and sheer size of the Titanic. 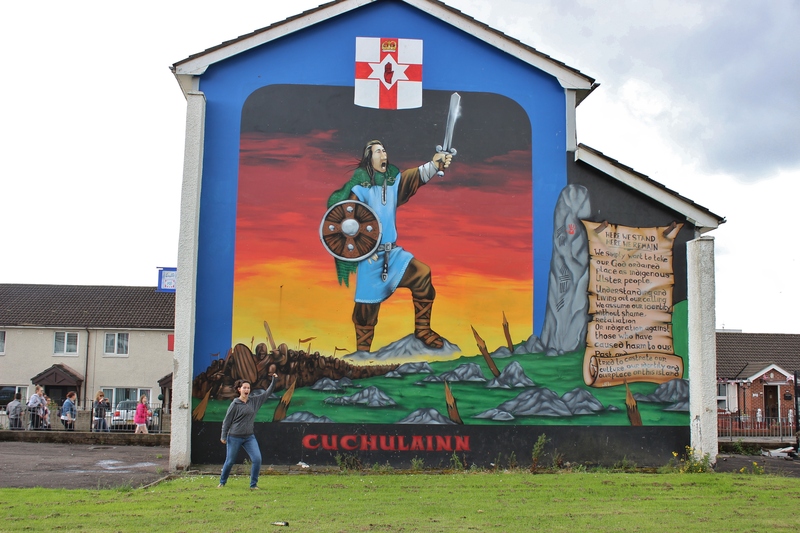 Unfortunately, though perhaps unsurprisingly, Northern Ireland is still highly divided today. Though the Troubles have been mostly political, religion also plays a factor in the tension. Protestants generally consider themselves to be British, and want to remain part of the UK under British government. Catholics, however, consider themselves to be Irish, and their dearest wish is for the British to GTFO and to have a united Ireland again. 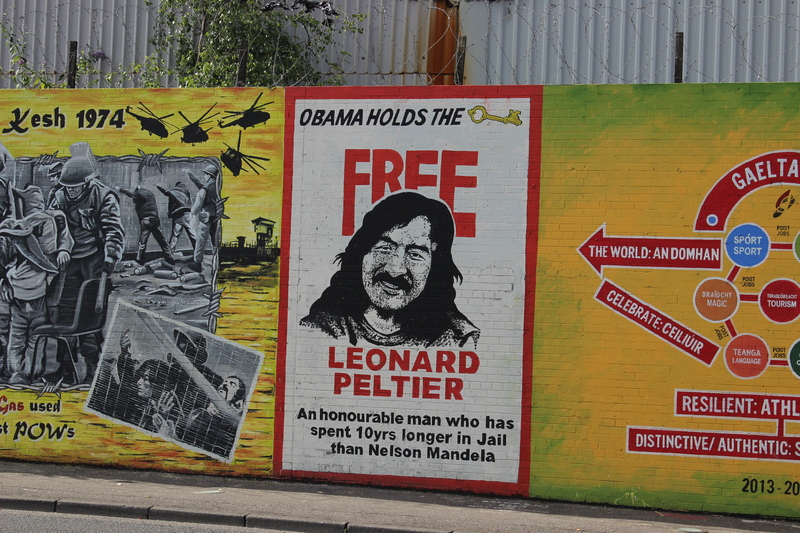 In Belfast, one of the most popular tourist attractions is taking a Black Taxi tour. The Black Taxis give relatively objective information about the history of Belfast and its feuding parties. 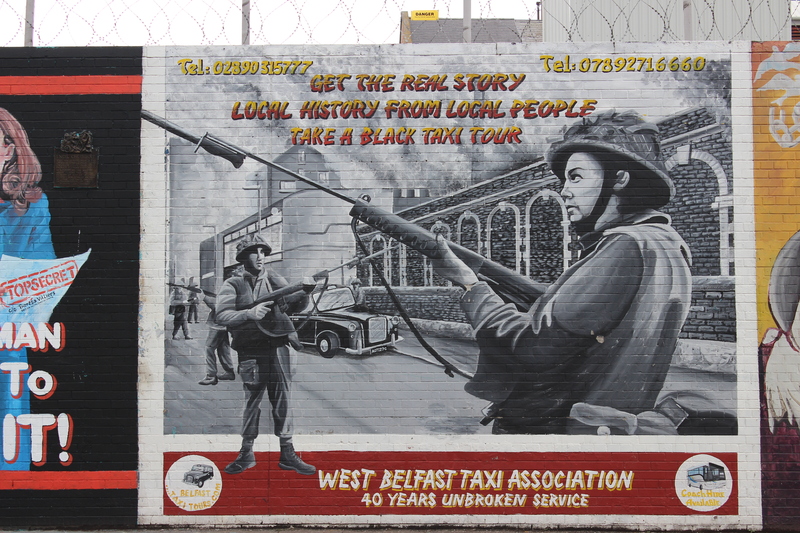 This photo is a mural on the peace wall, advertising the Black Taxi tours to promote awareness of the Troubles to outsiders. I highly recommend taking a Black Taxi tour (they’re only £8 or €10 per person); you’ll learn more from them than you can learn on your own, and they’ll show you a good deal of the political murals in the area. 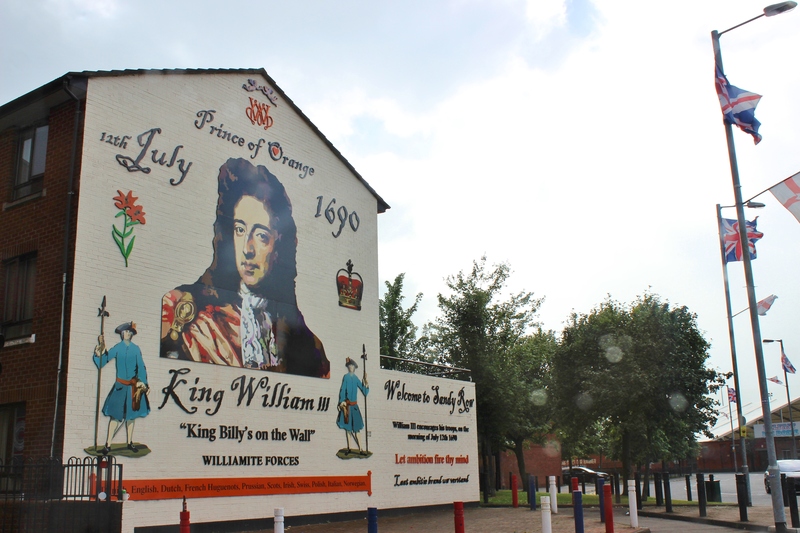 I’ll take a little time to show you some of the Protestant murals now and the stories behind them. This one is the story of the Red Hand of Ulster. 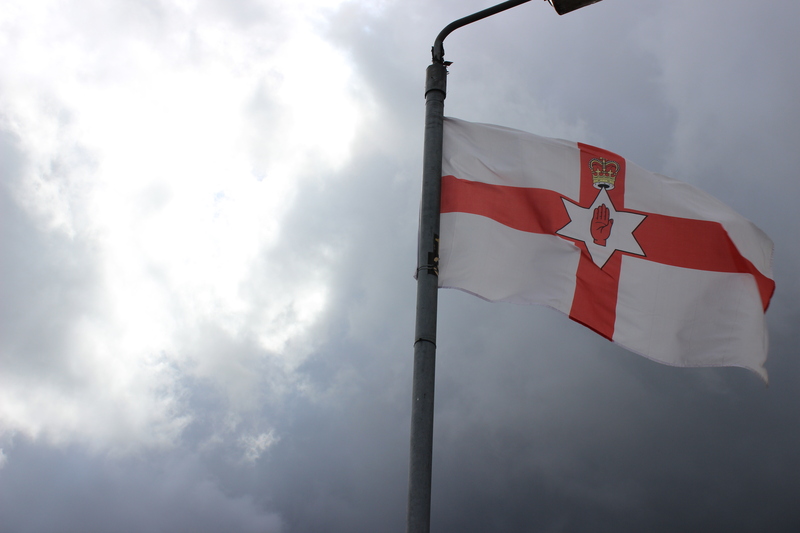 Ulster is the region of the Irish island that became Northern Ireland. The story goes that there were two brothers in a water race to win Ulster. Their father told them that whoever first touched the land would rule it. One of the brothers, in a rather ballsy move, cut off his own hand and tossed it ahead onto the shore, thus winning the race and the country. 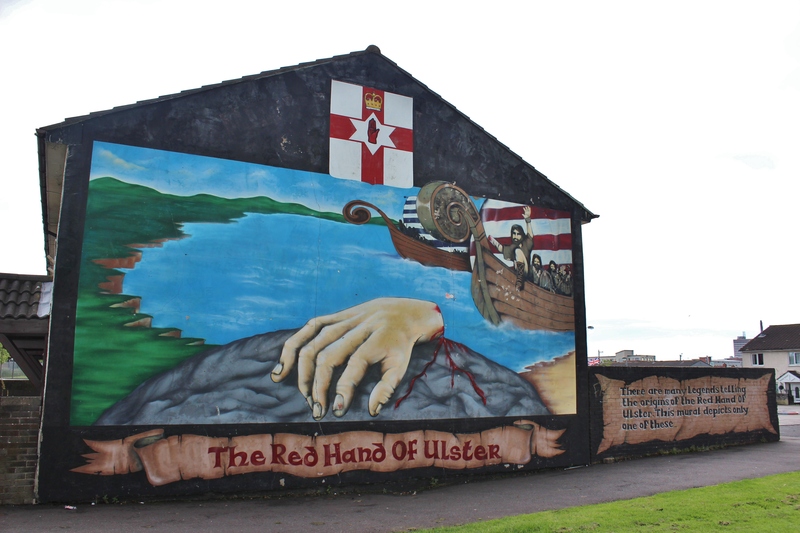 Till this day, the symbol of Ulster is the Red Hand, which they proudly display on their flag. 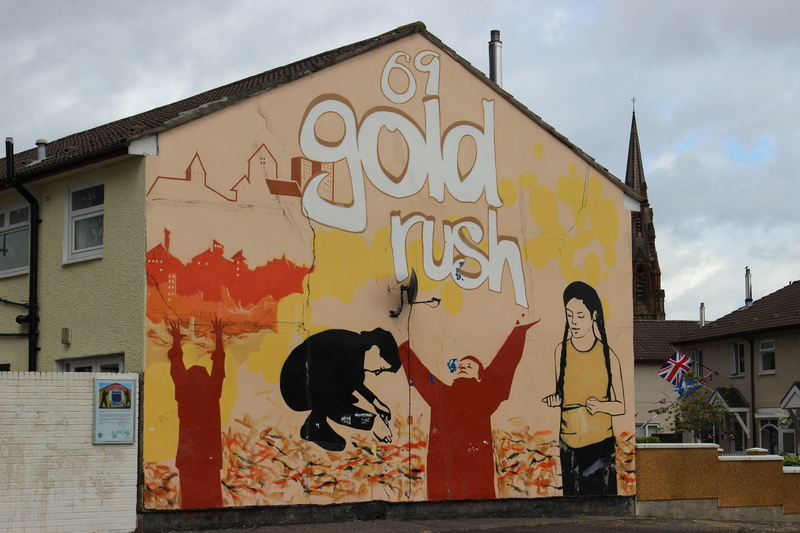 This mural is of the Gold Rush. The story goes that there was a man living in Belfast who was hoarding gold coins for many years and hiding them under his floarboads. Eventually he died, leaving his fortune unknown. Sometime in 69s his house was torn down and a child spotted one of the gold coins in the rubble. All the neighborhood children collected the gold and brought them home to their parents and neighbors, who tricked them into trading their coins for mere pennies. The last story isn’t really a story, but it’s kind of interesting. 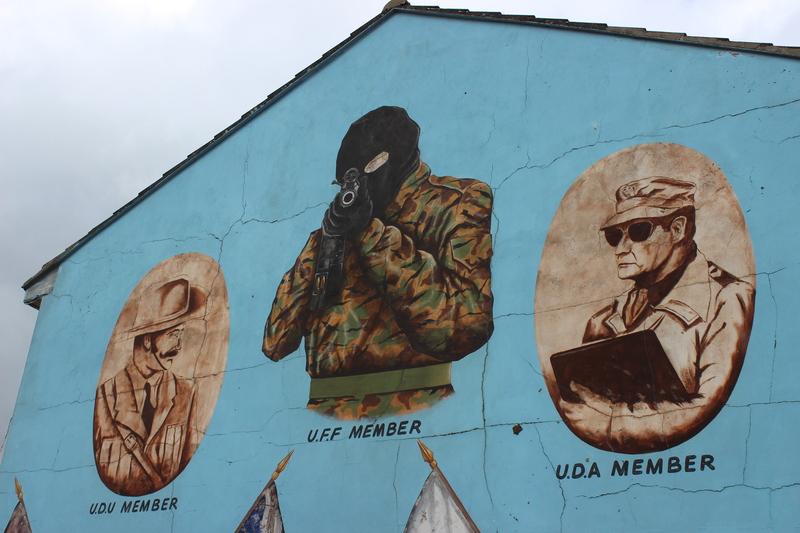 This mural is sometimes called the “Mona Lisa of Belfast” because no matter where you’re standing, the barrel of the soldier’s gun is always point right between your eyes. It’s a bit unnerving. 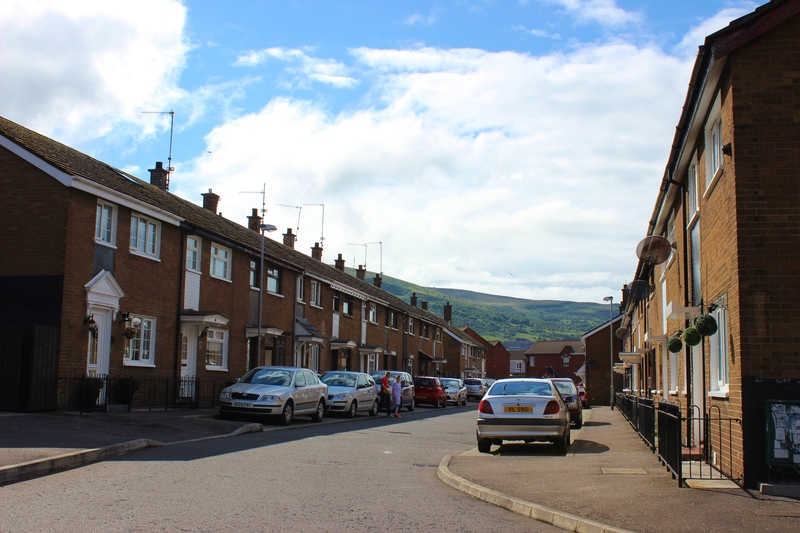 During the 60s and 70s there was considerable violence across the country (too many clashes to count, really), though much of it has been centered firmly in the capital city of Belfast. I won’t go into the politics of the IRA (Irish Republican Army) and all the other militant groups on either side of the struggles because it’s far too much information. The most notable conflict was the Bloody Sunday massacre of 1972 in the city of Derry, but we’ll get to that in the next entry. I said before that Northern Ireland is a divided country, but Belfast takes the word “divided” to a new level. 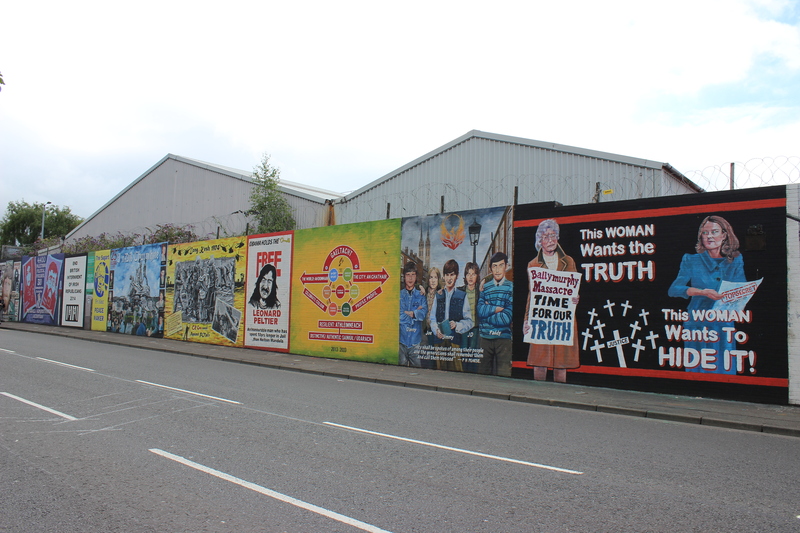 The Troubles between the Catholics and Protestants came to a head in 1969 – Catholics were holding civil rights marches protesting their unfair treatment (in housing, employment, and voting rights). Many of their protests were attacked by Protestants and the with tensions mounting, rioting broke out lasting several days. Eight people died and hundreds were injured. It was after this that the first section of the peace wall was erected. 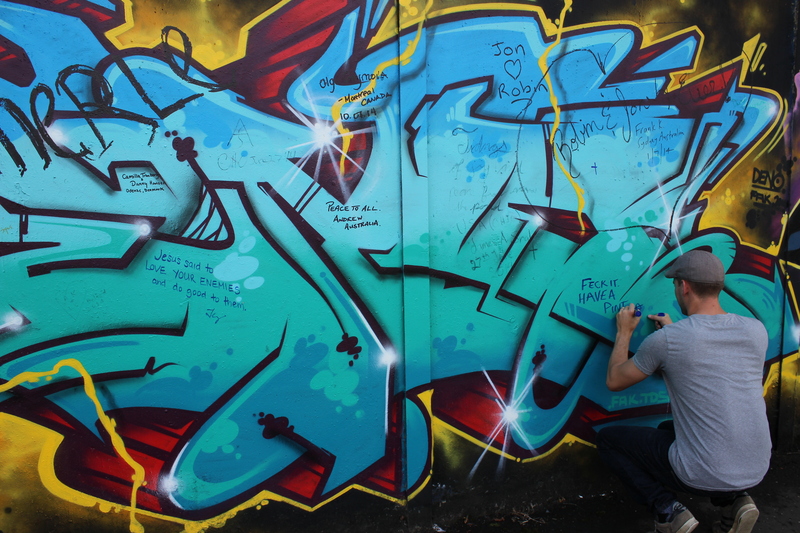 Originally the peace wall was supposed to be a 6-month temporary deter to anymore violence. 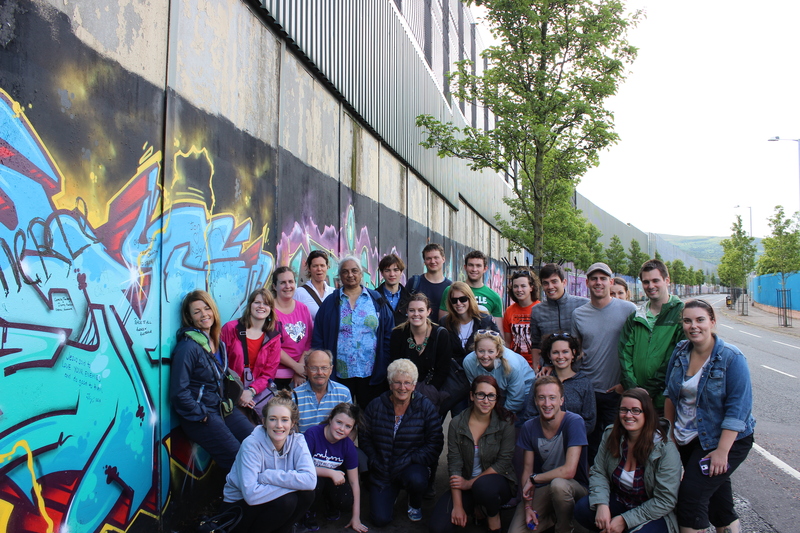 But over the years the peace wall has expanded and now it separates Protestant and Catholic communities, with the gates closing every night. It will not be coming down anytime soon. Our Black Taxi driver told us that a recent survey showed a majority of residents living near the wall preferred them to stay in place. 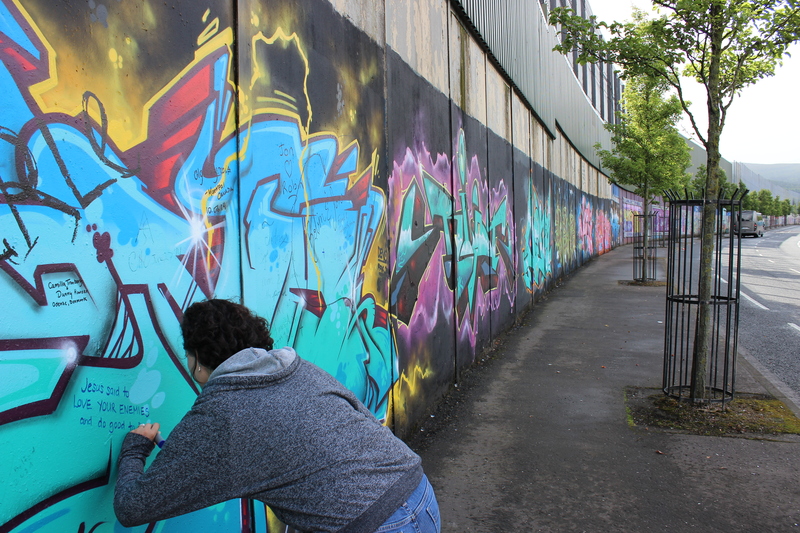 For many, the peace walls have become a security blanket even though there has been relative peace in the area for quite some time. In the spirit of keeping this entry readable, I’ll set aside the rest of the complicated information we learned about the Troubles in Belfast. Half of it I can’t remember accurately anyway, and the other half I’ve already told you. But I will say that no matter how much you know about the Troubles, you can’t understand how real it still is until you see it in action and hear about it from someone who has lived it. That’s another benefit of doing a Black Taxi tour – the drivers know the history first hand. After this sobering experience, we lightened up a little by going to dinner and then to a pub with live music for a few pints. I decided we should keep a beer tally throughout our trip, but I won’t give away the final numbers until the last entry. 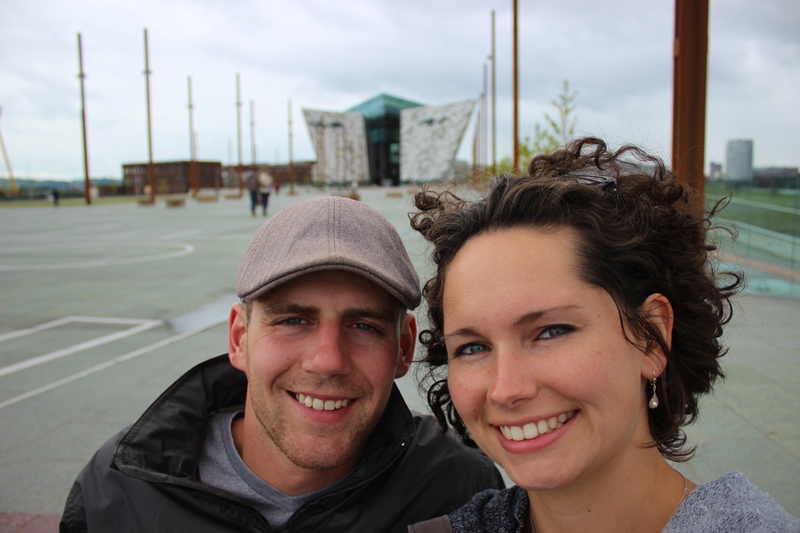 Stay tuned for Day 2 – a rope bridge, the Giant’s Causeway, and Derry city! 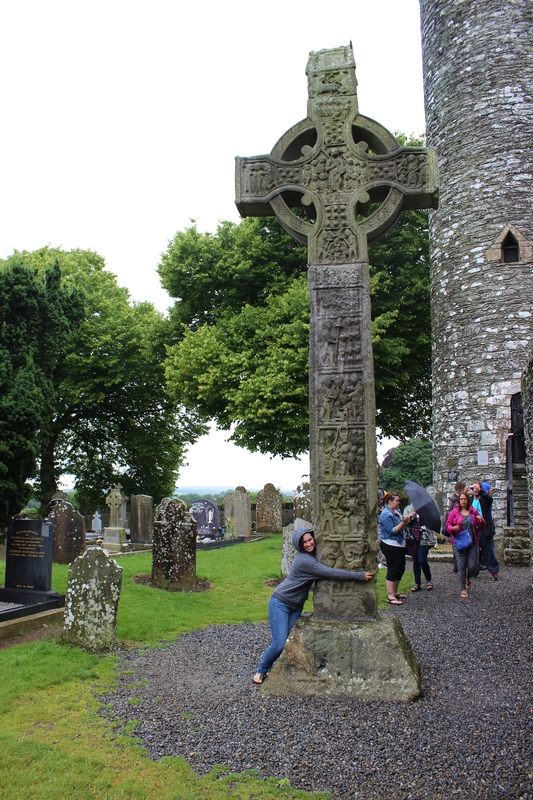 This entry was posted in Ireland Adventure, Travels and tagged Belfast, British, Catholic, cemetery, Emerald Isle, honeymoon, Ireland, Irish, monastery, Northern Ireland, Protestant, ruins, tour, travel, troubles. Bookmark the permalink.